Oh, wait... That's not what "donk" means? Whew. "Any POS late 80's or early 90's American heap (preferably an Impala) that has large enough wheels installed until it resembles (and rides and handles like) a Conestoga wagon. This is done so it sits up high enough so as to be at the same eye level as the Playas with real juice ridin in their Escalades. Adding in a bad candy paint job and Wal-Mart sub box completes the transformation. With no money left over for necessary suspension and brake upgrades, the lifespan is limited to a few drug runs or the first Police chase, whichever occurs first." This is a Pontiac Grand Ville (aka Grandville). In its day it was Pontiac's top of the line car. 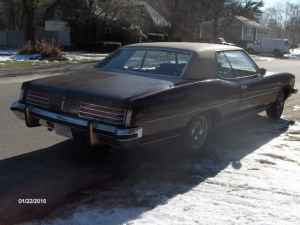 It was more "luxurious" than a Bonneville and arguably more sporty than the similar Oldsmobile 98 and Buick Electra. Pontiac built this car from 1971 through 1975. It sold in decent numbers for a few years, but it was really a car without an identity. The Bonneville had always been Pontiac's top car and and there was very little to distinguish the Grand Ville from the Bonneville. The OPEC oil embargo of 1973 killed the sales of big cars with big engines and the Grand Ville was discontinued in 1975. The Bonneville went back to being the top of the line Pontiac. OK, about this car... There is nothing really exciting here. It's brown. It has a vinyl roof. The drivetrain is the best you'll find in a 1970s GM luxury sedan. It has a 455ci V8 in it (which was standard on the Grand Ville) and a Turbo-Hydramatic(THM) 400 transmission. The THM400 transmission is an incredibly durable transmission and maybe the best ever built by GM. It was also used by Ferrari, Jaguar, Rolls Royce and Jeep, to name a few. They are damn near indestructible. The seller states that this car has a "duel" exhaust, which I guess means that if you're shot at, the car will shoot back. He claims the body is in good shape with just 3 small rust spots and the interior is in good shape, too. The seller doesn't say what year this one is, but based on the big bumpers it's a 1973 or newer car. The reality check - This is not a really good looking car (although the earlier pre-5 MPH bumpers cars look pretty good in a big US car way). It's got a big, thirsty engine, but it's not extremely fast. It handles like a big 1970s American car, which means that its handling is awful. Still, all that said, it's a piece of history that has survived for this long without accruing any real damage or modifications. This one deserves a better fate than being "donked" over. Located in Brockton, MA, click here to see the Craigslist ad. We had one. A 1972 with the 455, progressive 4-barrel and a kickdown switch on the automatic that exactly matched the opening of the secondaries. A huge wheelbase and lots of road-hugging mass made for a superb highway teleportation device. At 50, you'd step down on that loud pedal, blink twice and you were north of 75. It was enough to make a sexton kick a hole in a stained glass window. Every once in a while, it would get as much as 13mpg. Nearly double the around-town results. Gotta say, as a European there is something about big, gas guzzling, poor handling 70's cars from America which makes me feel like I have missed out a large experience in life. I was never a fan of them till my late teens when the Smashing Pumpkins released the music video to 1979, young kids driving around in a big comfy old thing (not sure what it was) which made me look at the tiny 4cyl, 1 litre things we were buzzing around in, there was no contest, I wanted the big cruiser. 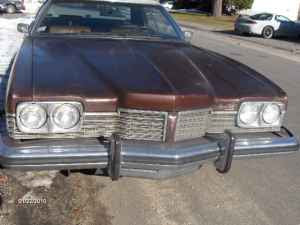 Someone buy it and save it from the Macco paint job, please, nothing wrong with brown, its 'retro' and 'cool' now. A funny post and a bad car! Hi Richard - "1979"... Great song, great video. The car was a Dodge Charger, if I remember correctly. Funny thing, have grown up in the US, I always felt like I missed out by never having piled my friends into a Mini and driving around London. I guess the "unknown" always seems better. If one is patient, there are quite a few nice "always in Grandma's garage" examples out there. Many have less than 50K miles on the clock. They sell cheaply and quickly as folks try to settle estates etc. Their values also took a recent nose dive when gas hit $4.00 a gallon. I've always admired the fact that Lowriders would even choose to invest numerous man hours fixing up cars that "the enthusiast crowd" would sneer at. I don't always admire the end results, but sometimes the finished product surprises me. I end up looking at cars I have pretty much ignored, in a completely new light. I could likewise admire someone who had the ability to make a gourmet meal based on a couple of cans of Beefaroni. I have always liked the cars with the over the top bordello interiors. It's a sure bet that car manufacturers will never again create front velour seats covered with overstuffed pillows. I think the "brown" car is a 73 grand ville. 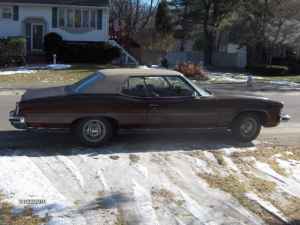 My dad bought a new 2 door 1974 Pontiac Catalina the year I was born. Needless to say, that's the car I drove when I turned 16...and I loved it. It had a 400 cc (6.5l) engine which I loved. After the A/C broke, it was always parked outside and began to rust. When I graduated college (and before law school), I spend an entire summer sanding the car down to bare metal and got it painted the original blue color at "maaco". Yeah, it was cheap, but it looked awesome. 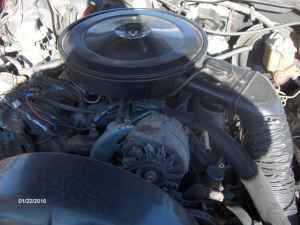 I even replaced the engine that summer. Anyways, I drove it in law school and it made me happy. I donated it in 2002 right before I got married. Whenever I'd travel to Spain (I was born there and I'm half spanish), I'd look at all the tiny little cars and dream about getting back home to drive the 19 foot boat. 10 months ago, I had an urge to get my hands on another 74 catalina, so my 2 year old son can see what "daddy" and "grandpa" used to drive. I ended up buying a blue 1974 convertible Grand Ville. I will not be donking this car. This one is rust free from Nevada. I hope my garage in Pennsylvania will prevent it from rusting for the next 14 years so my son can get behind the wheel and know what it's like to drive an american tank.